Ten million is a lot, right? I got that many points in about six and a half hours. The goal in the 10000000 game is to get a score of ten million in order to leave your castle. Why would you want to leave your castle? This match three or more, sliding puzzle iOS game by EightyEight Games LTD for the iPhone, iPod Touch, and iPad sells for $1.99 in the App Store. Think of it as a simple puzzle game with RPG elements that uses a different matching method compared to other match three games. Sliding your tile to make a match is a different way to play. This is the first game I’ve played that uses this method. It’s a little weird since moving the tile might make your finger go to the edge of the screen and even then you might not get it to the right spot. Stronger monsters frustrated me since it took a while to find matches and you might die from taking too long (gets crushed by “wall”). Using gold, wood, stones, and experience, you can upgrade your character and buy potions with positive and negative effects. It takes a while to gather enough materials and they have requirements to be unlocked. 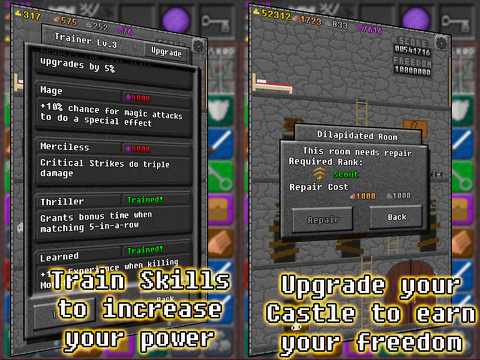 You can train your character’s skills such as doing more damage and earning more exp, upgrading your equipment, and having an alchemist make potions for you. There are nine potions total and they grant various effects including twenty-five percent chance to a critical or special attack but with a cost of doing twenty-five percent less damage (not a chance) and have a fifteen percent increase to your score (killing monsters I think) with the drawback of chests and doors having an extra lock. 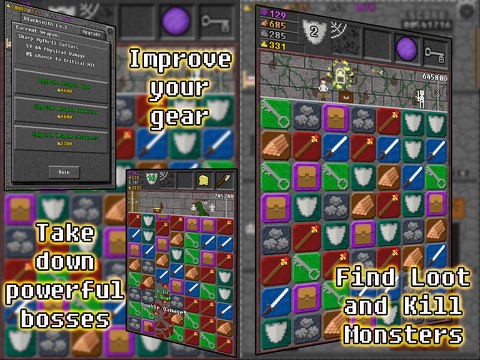 Defeating monsters might give items like scrolls that generate various tiles, spears, keys, and magic attack orbs. Every tile has a purpose so use them carefully. The app icon looks like a mushroom to me. That’s actually the character’s head. 10000000 uses well done pixelated graphics and the tiles are colorful. The dungeon looks like a dungeon with the grey bricks, roaming monsters, and treasure lying around. The game isn’t very informative about your character such as when taking damage and how many more hits your shield can defend against. Your character charges at the monster when he uses either physical or magical attacks. The game isn’t informative sometimes and a bit boring to look at but it uses a crisp retro style. The audio is not a very enjoyable part to me. The music and sound effects are repetitive. They’re fine the first couple of minutes but when I was trying to beat the game, I remember not paying attention to the audio at all. The sound effects sound like change moving in your pockets and your physical and magic attacks sound the same. Also, there is no iPod music support. I find the audio to be enjoyable at first but after a while, it gets boring. 10000000 is $1.99 on iTunes. It’s a bit pricey to me, if it was $0.99 that would be a great price for this game. Freedom is earned since there are no in-app purchases at the time of this review so there are no easy way outs. The pro tips are amusing but not always helpful such as telling people not to name a game 10000000. I hope EightyEight Games can fix some things such as adding iPod music support and character info when playing, I find the game to be frustrating and boring at times but it’s a different way to play match three. I’ll probably try to escape the dungeon every now and then. AppSafari review of 10000000 was written by Tony Lau on September 26th, 2012 and categorized under Action, App Store, Games, iPad apps, Puzzler, RPG, Universal. Page viewed 4865 times, 2 so far today. Need help on using these apps? Please read the Help Page.